I can barely move, much less work, in the middle of the summer. Something about extreme heat and humidity makes me want to fall into a pool and make like a baby hippo. But even baby hippos can loll about, here at the halfway point of the year, mulling over 2012 writing goals. Maybe you’d benefit from taking a look at where you are in your goals, too. So let’s grab a cool drink and see what you’ve got. I’m going to digress for just a minute to say that the more specific your goals are, the better you’ll be able to assess your progress. But I don’t want you sweating any more than you already are. 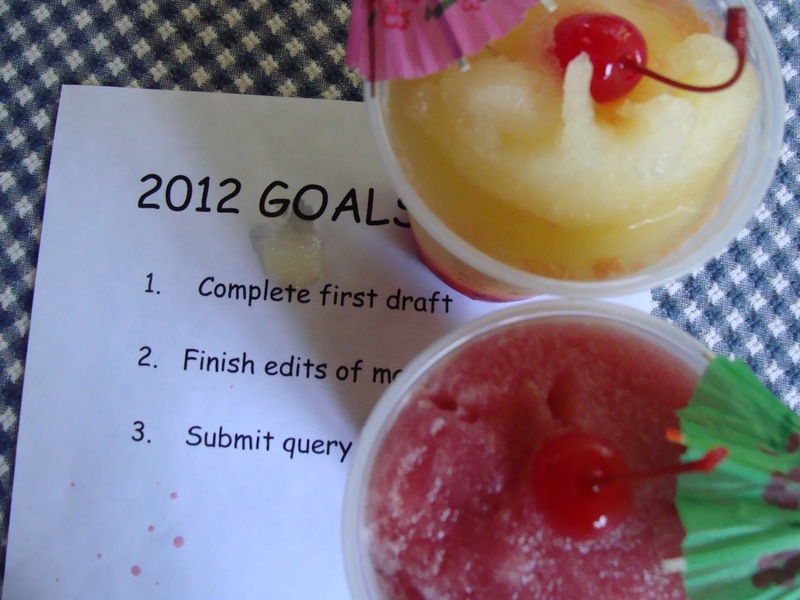 So for the sake of our exercise, let us say you wrote down some swell, specific goals. Like “Read the following books on writing…” And then you listed four lovely titles. Perhaps it’s something obvious. Like elves snuck into your house and stole every single writing book you owned except that one book cleverly stashed under your pillow. If elves snuck into your house, you’re excused. But if the reason is something less obvious, like you didn’t quite get round to it, then sorry, but you must think even more. Is the writing goal you set necessary and/or effective in relation to what you want to accomplish? The thing is, we make smaller goals to help us achieve bigger goals. And so taking the time to consider the pros and cons of any goal is absolutely worth it. At the beginning of the year, we have one perspective; at the halfway point, we may have a completely different perspective based on what we’ve achieved—or hope to achieve. So, thoughtfully consider where your writing is right now, where you want to end up, and what you must do to get there by the end of 2012. And after you’ve done all that thinking (and please remember to write down the important stuff! ), give yourself a pat on the back. And while you’re at it, give yourself another cool drink, one with a little umbrella in it. ‘Cause you (and even the baby hippo) have earned it! Yes, specific goals are best. The smaller and more pinpointing they are, the better. And yes, drinks with umbrellas are good. Later in July, the WWWPs (the Wild Women Wielding Pens) will have their "annual" meeting at a winery (to be determined soon). I won't even be drinking, and I'm looking forward to it. Perhaps by then, Sioux-on-a-Stick will be ready? Thanks for a wonderful post, as usual. Great post, Cathy! I especially like the part about asking yourself "Why am I not on task here?' and then evaluating your answers. Maybe you just dawdled or maybe the goal is not in line with what you're up to right now. Oh man. Why am not on task. Because I filled my schedule to the overflowing point, as I always do, and when I realized I couldn't do all of it, I did not of it, again, as I always do. I have now decided that if I can do one writing-related task each day, I'll be happy. I'm all for the cool drinks, though. I think meeting writer friends for drinks is a very worthy writing-related goal, in fact. Thanks, y'all...and um, am I detecting a trend here? Y'all seem MUCH more interested in the cool drink portion of the post--maybe we should call the ezine Women on Writing and How They Wet Their Whistle! Loved this post, Cathy! The half way point has a way a sneaking up on us, that's for sure. Since I'm not a drinker, I'll raise an ice cream cone and wish everyone well on getting back on track! Here's to the next six months...may they be as rewarding as the past six!